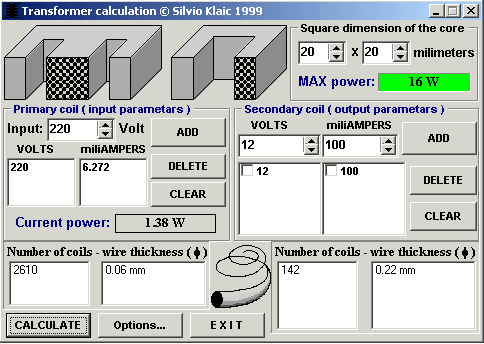 Transformer Calculation v0.1 is program for calculating number of coils and wire thickness. If you have some experience in assembling transformers, then this program is perfect for you. If you don’t known anything about assembling transformers, please don’t use calculations from this program for building your own transformer! Wrong calculation can do damage to your electric device attached to electric network, and IT CAN KILL YOU !!! You can still use this program to determine how big EI core of transformer must be, if you plan to buy transformer. Note there are lot of transformers that are hybrids, so if you need transformer for amplifire buy right sized transformer. Hybrid transformer are ordinarily small and under high load it can overheat. This program can calculate values only for standart transformer core, that’s “W” and “U” profile of core. Toroid transformers (ring profile of core) and others aren’t supported. i shall reach back to you when tried and confirmed OK.
It’s at the bottom of the article where it says “Download”. It just above the comment section. I have to say tho, I didn’t see it until the third time I looked. It doesn’t exactly stick out. Where Flux max for the particular core is in Webers. Most core material saturates at a flux density a bit less than 1Wb/m^2, so you need to find that value for the material you have. Measuring the cross+sectional Area (m^2) of the core, and multiplying by the max flux density you want in the core, will give you the maximum flux available. Where e is the no load voltage. MOst Wanted!! Great Soft!! !Very Thank!! 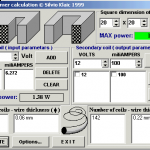 calculation of turns per volts…. but sir how to the calculate swg no? This is a nice software Thanks a lot. I cant install your software on window Vista? Vista says it is a win32 only installation. HOW CAN I RUN IT ON WINDOWS 7 64 BIT? Hi, I’ve been having trouble trying to download this program; after I get through the first part of the process, I get this message: “Windows cannot access the specified device, path or file. You may not have the appropriate permissions to access the item.” Is there anything specific I would need to do this successfully? If it helps, my computer uses Windows 7.
hi its good for all ,i’m happy to use it your softwares are needs extarts its no goodfor all thanks…. this version its not accepted for windows system 64bit what i must do ? I am unable to download this software. Will somebody help me. Do you have a version that runs under windows 7 ? please kindly help me out, Admin. I can’t run the software on a 64bit system. I recieve the complain each time I try. Is there a 64bit version of the software please? show me the link please. Thanks. Is there a 64 bit version of this software? Is all results from software are proven??? tanks its very gooooood tanks tanks tanks……. Could someone put the Installed Program Folder (including Subfolders) into a .zip or .rar file? I run windows vista @ 64bit and the installer doesn’t install because when the program was made, 64bit windows didn’t run 32bit programs like this. But if you put the installed program in a .zip file, I just unzip/rar the file and run the program without installing it and it should work! gr8!! post similar n live long!! 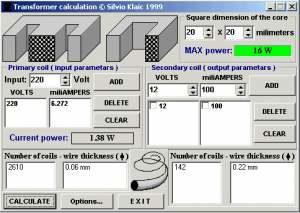 Thanx for the software; but I’m having difficult on how to determine the tansformer IE core square dimension, please help. Very nice app, but what about frequency? it is not included in the calculation formula. And what about Hi Frequency, Iron core transformers. it can’t be installed or not compatible to windows10 64bit and windows7 ultimate 64bit. it’s shows “unsupported 16-bit application”. It works just for 32bits windows versions. With 64 bits it doesnt work. – Open the exe file with WinZip or WinRar, don’t double click it. Extract to a new folder. See that you have the setup.exe file there. the software does not run on my computer because my computer is 64 bit. There is any advice? I’m unable to download the software on my phone (techno y2). Can somebody help me? the software does not work on windows 64 bit. is there 64 bit version? i nead a 64bit software.